Join us to learn about container runtime security, and how to secure your container runtime environment with Falco and Kubeless. We'll also demo Falco detecting abnormal behavior in a container, and Kubeless taking action on the compromised container. As cloud-native adoption continues to accelerate in enterprises, organizations are increasingly gripped with the challenge of operating Kubernetes and container-based microservices in production. While these technologies have made it possible for developers to more quickly iterate and deliver their software, the operational challenges involved with this new platform presents a host of new challenges unlike anything enterprises have faced in the past. With such challenges, however, come great opportunities to radically rethink past problems and inefficiencies. Containerized, cloud-native platforms are no exception. An increasing number of enterprises are leveraging Kubernetes in production, yet do not foresee the inevitable changes to their infrastructure security and monitoring. As cloud-native architectures and a DevOps approach to development grow, learn more about best practices for implementing and scaling Kubernetes security in your organization. With the rise of technologies like Docker, Kubernetes, and underlying cloud infrastructures, enterprises are moving towards cloud-native architectures that leverage microservices to run their critical business applications. While this shift has tremendous business advantages, it also creates significant security and compliance challenges. Modern apps built from isolated and often short-lived processes can leave blind spots in security and performance visibility. Join Sysdig to learn how tapping into Linux-native eBPF helps enable deep observability for your containers, hosts, networks, and more. If you’re involved with developing applications, chances are you’re being tasked with adapting to cloud-native infrastructure and being able to support cloud-native workloads with solutions like containers and Kubernetes. Join this discussion with Sysdig and IBM Cloud, who have recently built a partnership focused on improving monitoring and troubleshooting for your modern DevOps services. Together, IBM and Sysdig have launched a new offering that provides end-to-end monitoring capabilities in the IBM Cloud. You’ll come away with a better understanding of key visibility challenges and solutions that will help you successfully deliver the apps that drive your business. Kubernetes is now 3.5 years old, the technology has matured, and adoption of containerized applications orchestrated by Kubernetes has scaled beyond tiger teams. Enterprises are more comfortable with Kubernetes, and by default, more comfortable with containers. We predict that is only the beginning: Enterprises will migrate mission-critical, stateful applications to Kubernetes in droves in 2019. As a result, security and operational visibility needs are growing. Solutions that support enterprise-level capabilities, processes, and support become the requirement. If you’re moving to containers and microservices, monitoring and security should be at the top of your requirements list. With the extra layers of abstraction and orchestration of solutions like Kubernetes, you’re certain to find that approaches you’ve taken in the past with VM and bare metal-based apps are insufficient. Sysdig can help. Containers and orchestrators: why containers have revolutionized IT infrastructure, why do you need them and which orchestration technology is right for you. Setting up a CI/CD/CS delivery pipeline: how containers, continuous integration and delivery make your pipeline more agile and how it all fits together. Monitoring containers: why this is different and so hard. What are the different approaches and how do tools like Sysdig Monitor and Prometheus compare. Securing containers: security cannot be missed. What are best practices for container security, including vulnerability management with image scanning and compliance, runtime defense and forensics. This is plenty to cover, so be prepared to rock containers hard! Platforms such as Kubernetes make it easy to provide development teams access to the infrastructure resources they need to run their applications in a Cloud Native and scalable fashion. But what happens after your initial platform deployment and how can you provide a secure platform for development teams? In this webinar we’ll cover how to get started using Google Cloud’s managed Kubernetes offering, Google Kubernetes Engine. We’ll deploy a GKE cluster then show how to secure it using Sysdig’s open source project for intrusion and abnormality detect, Falco. We’ll cover the common concerns around security on Cloud Native platforms, and show how Falco provides the additional layer of security for the container runtime environment. Finally, we’ll show how to integrate Falco with Google Cloud Security Console to provide a consolidated view of security across your entire Google Cloud infrastructure. Sysdig loves Prometheus! Attend this webinar to hear about our launch of enterprise-grade Prometheus monitoring with Sysdig Monitor 3.0. We've added new Prometheus capabilities and enhancements for our already rich Kubernetes monitoring. If you love Prometheus like we do, and your cloud environment is growing quickly, join us to learn more about what we’re doing with Prometheus, Kubernetes and more. Containers have sped up the CI/CD process. It’s now easy to package up an application and deploy it in a matter minutes. This allows teams to move faster, and makes it easier to patch software that may contain vulnerabilities. However, this increase in speed has create a need for new processes and tooling. Enterprises are taking advantage of AWS, Google, and Azure along with private data centers as they move toward a multi-cloud strategy. Thanks to container and orchestration technology, deploying and moving applications and services across clouds is easier than ever. But how do you monitor performance, health, and security across diverse, distributed infrastructure? And how do you see what’s happening inside your containers across clusters and regions to ensure you’re meeting your business goals? Containers have changed the way we build, deploy, run, and investigate what goes on with our applications. It’s critical to validate that you’ve configured your containers securely, they don’t include any vulnerabilities, and enforce they are doing what’s expected in production. - What are the key metrics and components to monitor in a Kubernetes environment? - How do containers complicate monitoring and what you can do to see inside? - When should you set alerts, and for what, to keep on top of cluster behavior? - What role do custom metrics (e.g., Prometheus) play for observing app behavior? - How do you troubleshoot in an auto-scaling, distributed environment? This webinar will include a demonstration of open source and commercial tools that can help you solve these new challenges. Attend to get insight that will help you operate Kubernetes deployments in development and production at any scale. Container security is top-of-mind for any organization adopting Docker and Kubernetes. In this session Sysdig and Anchore present how you can build a complete open source container security stack for Docker and Kubernetes with Falco and Anchore Engine. 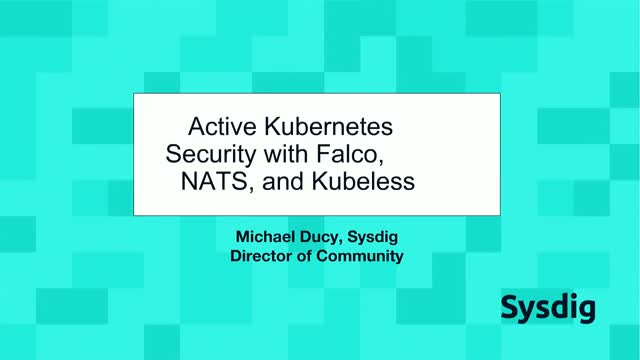 -Using Falco, NATS and Kubeless to build a Kubernetes response engine and implement real-time attack remediation with security playbooks using FaaS. -How Anchore Engine can detect software vulnerabilities in your images, and how it can be integrated with Jenkins, Kubernetes and Falco. Almost 5 years, 48,000+ github stars, and tens of thousand of production deployments later we can safely say containers are a technology that is a here to stay. Theyre developer friendly, easy to operationalize, and allow organizations to provide stable and secure services to their customers. While there are clear best practices for what it takes to build and run containers, there isn't as much knowledge around the performing forensic analysis of incidents that occur inside your containers. Developers have numerous options for instrumenting code to monitor and troubleshoot application performance. When should you turn to custom metrics like Prometheus, statsd and JMX? When are tracing and APM the right fit? How do these solutions compare? Effective security requires a layered approach. If one layer is comprised, the additional layers will (hopefully) stop an attacker from going further. Much of container security has focused on the image build process and providing providence for the artifacts in a container image, and restricting kernel level tunables in the container runtime (seccomp, SELinux, capabilities, etc). What if we can detect abnormal behavior in the application and the container runtime environment as well? In this talk, we’ll present Falco - an open source project for runtime security - and discuss how it provides application and container runtime security. We will show how Falco taps Linux system calls to provide low level insight into application behavior, and how to write Falco rules to detect abnormal behavior. Finally we will show how Falco can trigger notifications to stop abnormal behavior, notify humans, and isolate the compromised application for forensics. Attendees will leave with a better understanding of the container security landscape, what problems runtime security solves, & how Falco can provide runtime security and incident response. Almost 5 years, 48,000+ github stars, and tens of thousand of production deployments later we can safely say containers are a technology that is a here to stay. They’re developer friendly, easy to operationalize, and allow organizations to provide stable and secure services to their customers. Kubernetes security features focus on infrastructure layer: verifying that configuration is safe, follow the security best practices, the last privileges and your deployment has no known issues. How that compares with runtime security?